When I lived in Japan, I attempted to enjoy an ikebana (“flower arranging”) class in my tiny town of Tottori. Unfortunately, as my kind yet severe instructor informed me, “while you may be Japanese on the inside, you still have an American aesthetic on the outside.” I watched as my sensei dismantled my unbalanced arrangement slowly and systematically, informing me that I would need to try once more. This Thanksgiving, I finally earned redemption by embracing holiday tradition by attending a floral design class in Orlando. The Publix Pilgrims are a Southern Thanksgiving table staple. At the top of the month, my gal pals Melissa and Elizabeth invited me to a creative and relaxing girls’ night out at East End Market. 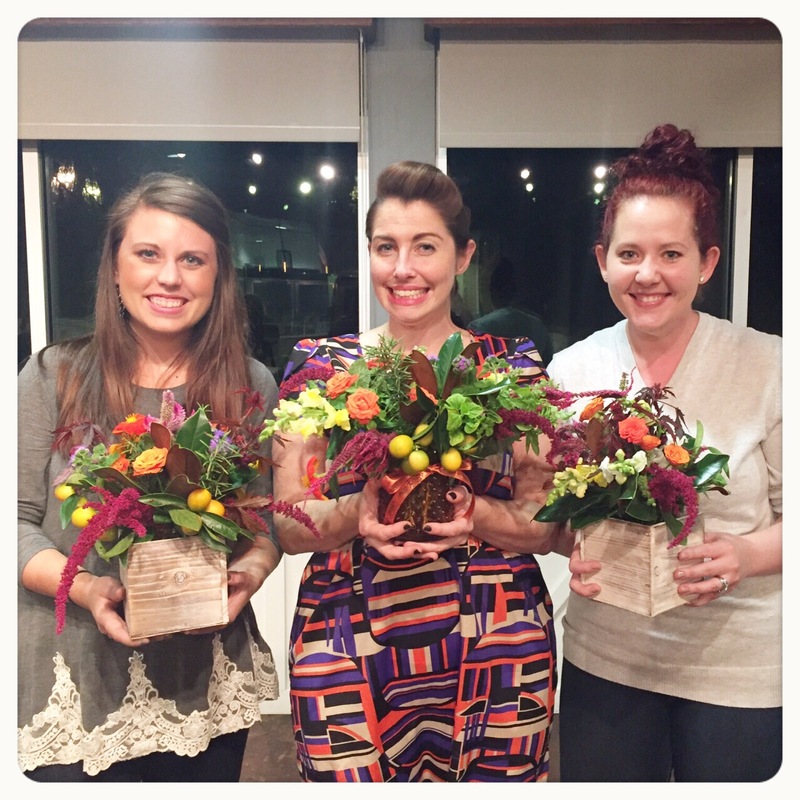 Unlike the usual bar drinks or coffee and cafe time, we met up for Thanksgiving Flowers & Wine lead by Eileen of FarmGal Flowers. I fell in love with Eileen’s work when I attended Melissa’s brain child Blog Fête in September. The last few months have blurred together, and suddenly, the holidays are here. It had been a while since I met up with two of my favorite Ladies of Orlando, so I couldn’t help but say yes! There are people you meet and have an instant connection. Through social media and mutual friends, I became acquainted with Eileen. I absolutely loved that she not only grew her flowers on site at EEM, but she truly has a passion for her work. Although it was my first time meeting her, Eileen felt like an old friend, so I couldn’t help but want to roll up my sleeves and help see my friend’s event succeed. I have to horrible tendency of arriving early to events, so naturally the Girl Scout in me wants to help with everything. Lo and behold, my wine opening skills were quickly put to use as the corks were being stubborn and we had ladies arriving for happy hour! Tip: Use a rotating cake stand to check the balance of the arrangement! Height: Make a fist, put the elbow on the table, and don’t make the arrangement higher. This will prevent creating an arrange which inhibits conversation across the table. Flower Food: It is recommended, and most packets have sugar and antibacterial to help make arrangement last longer. Foundation: Use greenery first to establish base, not as a filler afterward. Freshen Up: Change water every 2-3 days depending on the flowers with fresh snip. Nipping ends help for water uptake and open irrigation. Stay Shady: Keep cut flowers out of direct sunlight to prevent wilting. Odds in Your Favor: Use cuttings in odd numbers (3, 5, 7) to spread focus over the arrangement. 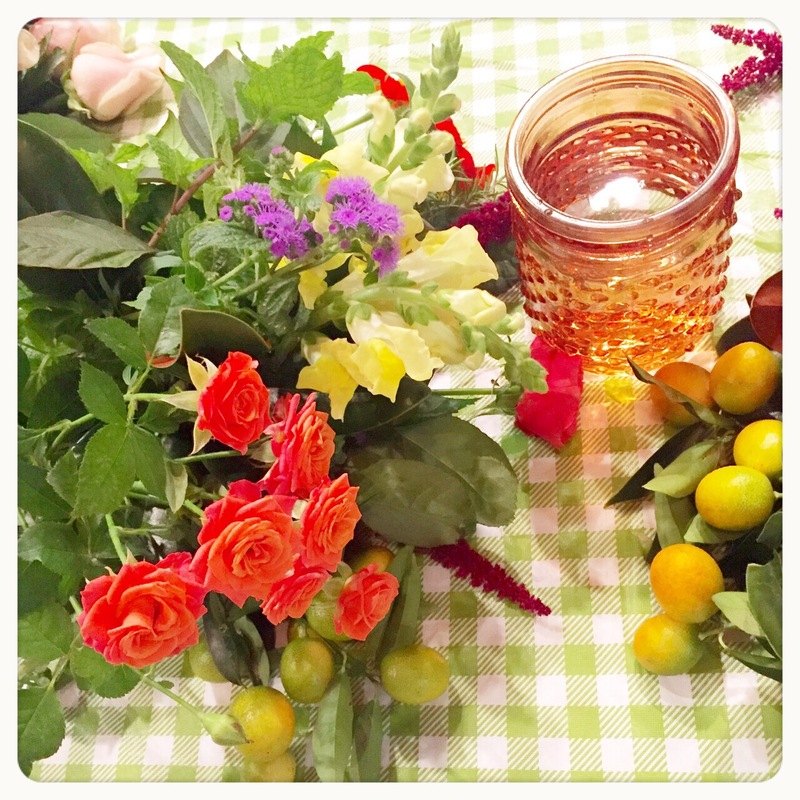 Go with the Flow: Arrange flowers using their natural bend. Don’t try to force the flowers to lean in opposite directions. Dress the Vessel: Add a ribbon or ornament to the vase to continue the celebration beyond the flowers! 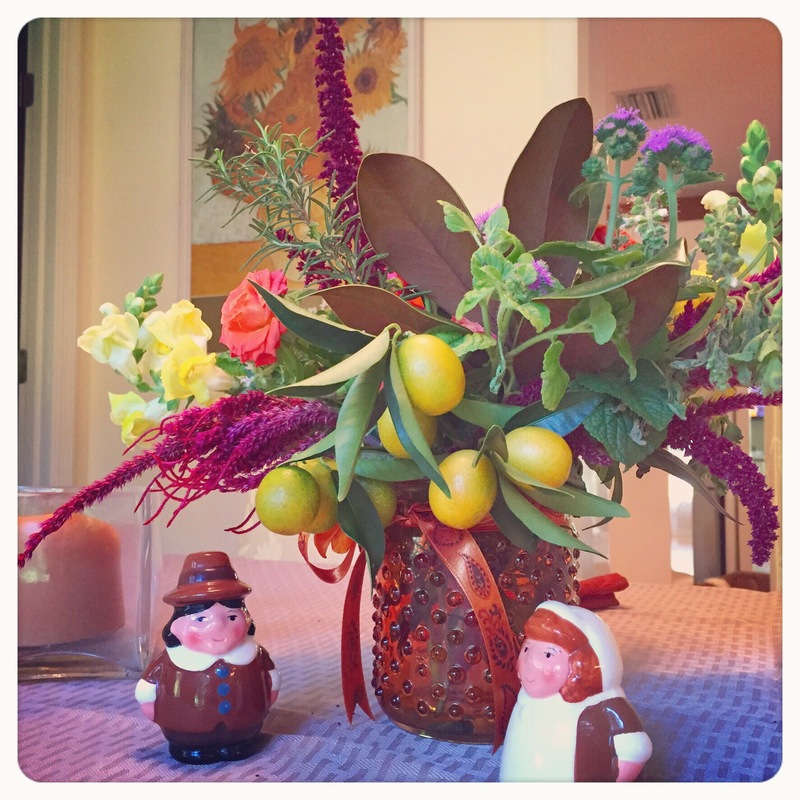 Southern Girl Bliss = Magnolia, Kumquats, Ribbons and Jam Jars! One of the things I love about meeting with friends that share common interest is the fun and laughter that often ensues. A sign of true friendship and kindred spirits is the ability to let life get in the way and time to fly by, but when meeting up again, it’s like a beat hasn’t passed. The works of M+E embody two facets of my personality: nerdy and southern, so sitting with them during class meant I giggled and geeked out like I was 16 all over again. What I love about these ladies is they inspire me to expand my interests. I’ve never been one who entertains, largely because I haven’t had the confidence or the patience to sit down and plan something fancy. Catching up, Melissa posed great question: if you were to have a nerdy party, which fandom would you choose? Being a Renaissance Nerd and avid film lover, I honestly couldn’t decide off the top of my head. I found my head swimming with the prospects of finally hosting classy, nerd chic dinner parties, movie marathons, or potential pajama parties! The biggest dilemma will be selecting the top batter for the series, but my brain is already overloaded with idea. With the holiday hustle upon us, the New Year will be primed for fostering friendships over geeky gatherings! FriendsGiving: Thankful for friends who become family. When I count the things I am thankful for so many things spring to mind. I have my health and happiness which stem from my relationships with my family and friends who love and accept me with all my intricacies. I have job that keeps me grounded with an imagination which keeps me chasing my dreams. In a perfect world, I would love to celebrate something quarterly because I’m realizing that friendship, family, and thankfulness should be celebrated year around, not just to the last two months of the year. I would love to collaborate with some more seasoned party-throwers to coordinate one of these nerd feasts! What has made your most thankful in 2015? When designing your table arrangements, what are your essentials (fabrics, accents, candles, flowers, figurines…)? When hosting a FriendsGiving, how many guests do you invite and do you do all the cooking? P.S. 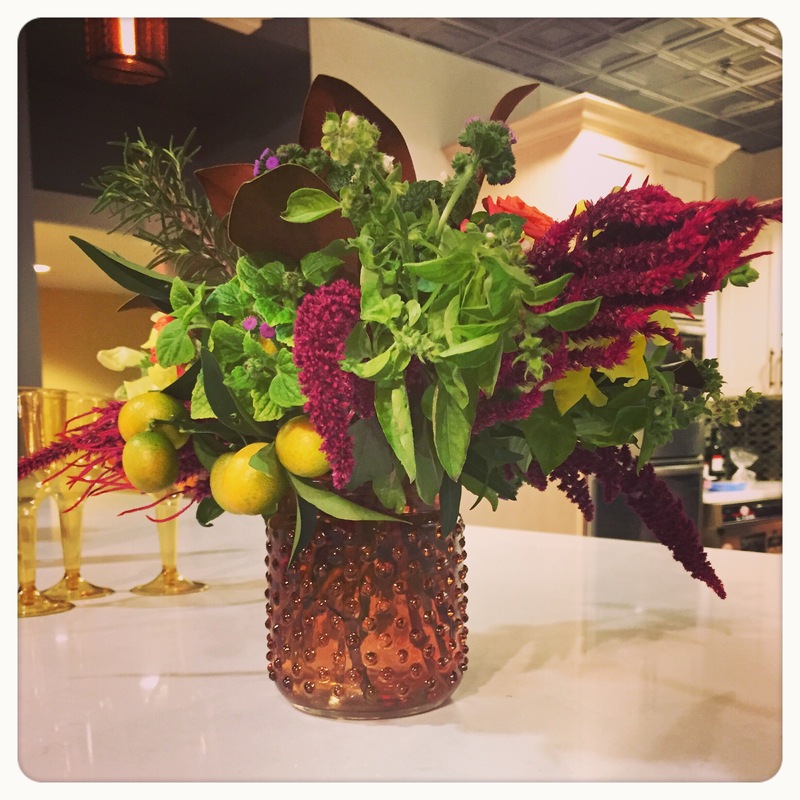 I love how we each designed different arrangements with the same materials, (and check out my modeling skills on Melissa’s write-up)! 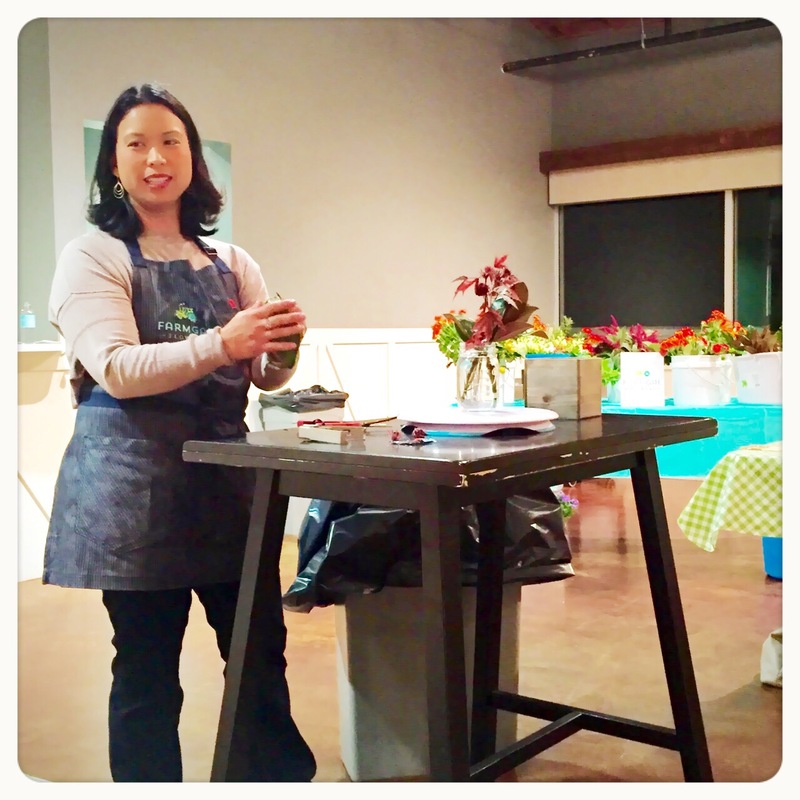 I can’t wait for Eileen’s next floral adventure!